Of all the genres of games released on the app store, no other genre commands the pure number of downloads that Hypercasual games do. The simplicity of the gameplay, coupled with the speed of gamers learning and mastering the challenge creates a voracious need to download the next new idea, older games are quickly discarded or deleted. This has not escaped the notice of many game developers with hundreds of studios trying to build the next mega hit. However, Voodoo has truly mastered both the sourcing and promotion of their titles making it tough for studios to compete. How has Voodoo dominated the Hypercasual space? Voodoo doesn’t care about your game’s design. Voodoo cares about your game’s market potential. As a publishing house, the majority of their releases can clearly be seen as “inspired by” reproductions of older games. In each case, success is not down to the game mechanics or technical quality of the product, but Voodoo’s ability to market games more effectively and reach a larger audience than those original games. Bad game design still won’t make the cut, but innovative game design is not as important as tried and tested successful mechanics. If you want help with your hyper casual game design we wrote a post of the Top 10 Hyper Casual game mechanics present today. This is very hard for the average game developer to swallow and it’s hard to think that game design is the least important aspect to Voodoo’s success. What set’s voodoo apart is their ability to work with a large number of talented studios each working on simple, tested, game designs, and then apply industry-leading marketing and growth practices to push games to the top of the App Store. Dictating which game design is the most popular is something the market decides, not something Voodoo strives to set. 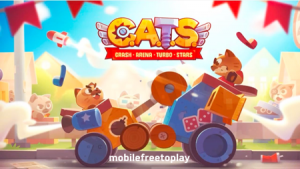 Making rough approximations through tracking the releases of the majority of HyperCasual publishers on both Google Play and Apple App Store, Voodoo have released 7 new titles that reached top 300 in the US Free in the last 30 days. Most of the other publishers have released between 0 and 2. This is a phenomenal pace compared with classical studios or even publishers who might schedule 1 or 2 apps per month in order to give it the support needed. This highlights a fundamental shift in business practices. Most developers’ first start to iterate, test and soft launch titles in cheaper CPI countries such as the Philippines or New Zealand. 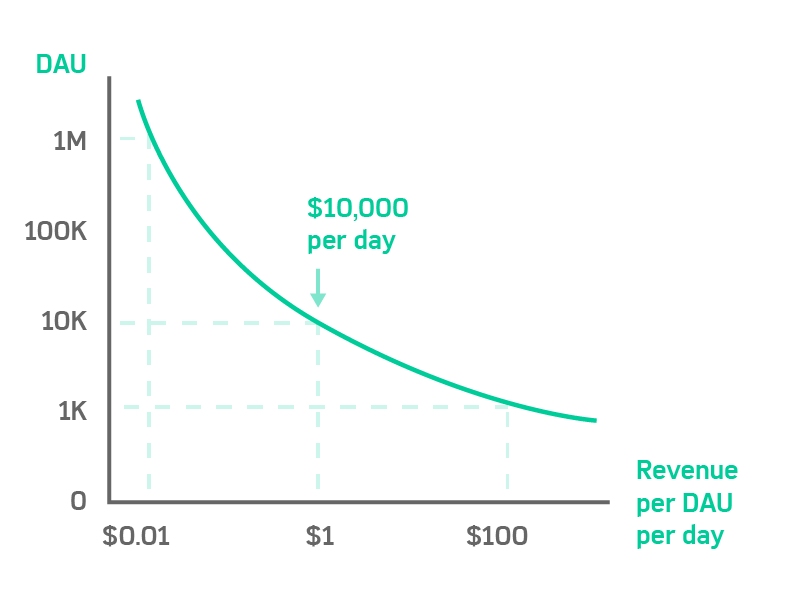 Based on the feedback they got back from players, designers and developers optimize and iterate the FTUE or monetization balance to slowly improve the LTV and retention. When a studio is confident in their polished products, they would approach Apple and Google to showcase their app and hope for a feature. At the same time, they might allocate a large marketing budget and test multiple ad variants in order to be confident in having the largest splash possible. This is too slow for hypercasual, this is not the way Voodoo approach app releases. Voodoo may have 100-200 development studios each working frantically on new game designs. In each case, the focus is the core gameplay. The meta and even the advertising is left out for the initial soft launch release. Core loops are then tested without fanfare into key territories such as the US or China in order to see if there are good responses to the mechanic. 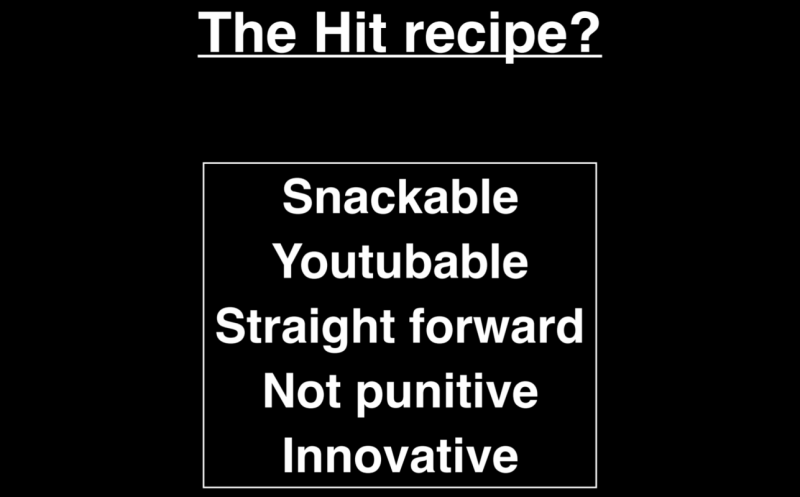 Voodoo released a simple guide for their gameplay style (Snackable, Youtubable, Straight forward, Not punitive, Innovative) which clearly restricts multiple game designs from the table. Games are then measured on a brutally tough scale. Each game needs 50%+ D1 retention to even make the cut. This creates a very competitive environment where stats and data become the key to becoming picked up by these top publishers. As a developer you want to know that your game can actually reach a large audience, this is where Voodoo has developer a lot of skills. 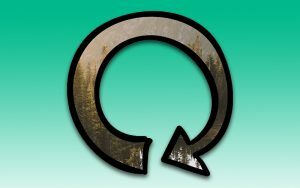 In a system where CPIs are low, games can grow fast. If you’re able to spend $1 and make $1.50 back then you should just keep spending more money and grow faster. This relationship is often quoted as LTV > CPI (check out the bible for more details). Different genres of free to play mobile games have different monetization profiles and can roughly be categorised by their mechanics or via their audience. 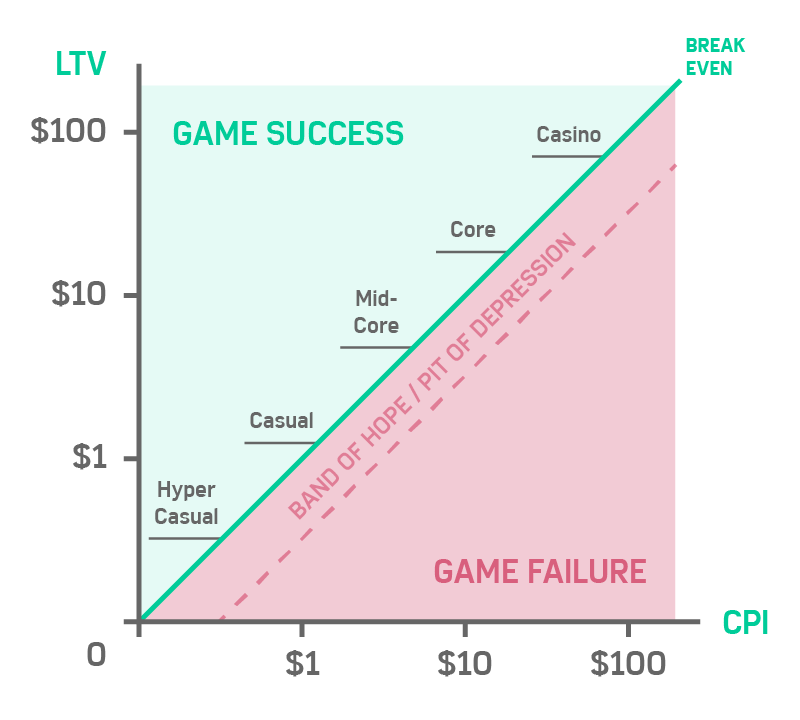 Games with the highest monetization profiles (i.e Casino games) are able to spend $50+ per user because the LTV of their titles is very high. However, their audience is usually quite small. IAP based monetization models focus on generating the most revenue per user but in doing so their audience becomes harder to find. Hypercasual as a genre works so well because they can lower the CPI to incredibly low levels through clear advertising creative and data-driven programmatic marketing. However, without clear IAPs or items or gacha systems, the model relies on users watching and engaging with advertising. Getting the balance between a very low CPI while maximising the Advertising yield is where the profit is. Voodoo is in a better position to maximise this than other studios. Due to their immense size and scale, they have more relationships at better rates than your average development studio. This means the ads they show are more likely to result in higher paying installs, increasing the LTV further. The mobile ad networks are ruthless and competitive: everyone wants to work with the largest player. When considering the Hypercasual segment as a business strategy you must take the business development time into account. 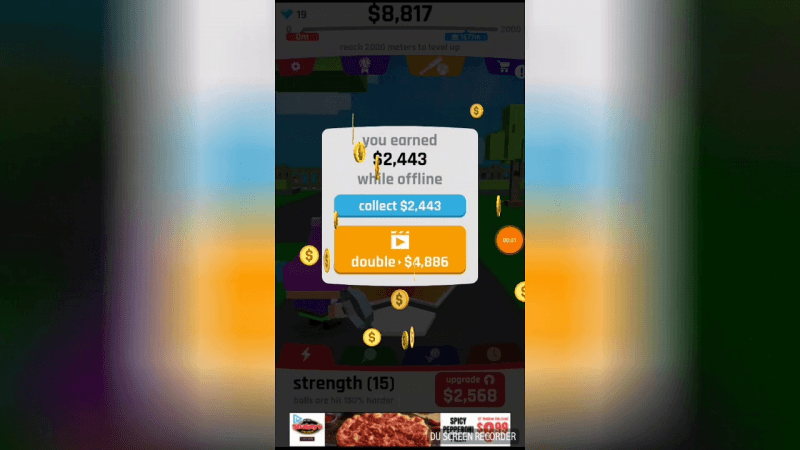 #5 Voodoo can scale games into profitable cash cows. What becomes hard for developers is to perform this correctly and at scale. This requires a team of people to analyse, review, create and then execute effective marketing. Voodoo has learnt how to do this very well. The biggest mistake most game developers make when attempting to attack the hypercasual gaming market is to think they can innovate through game design. Voodoo has proven that innovation in game mechanics is not as important as cheap and effective marketing. Their pace of release and the scale of their network is growing all the time allowing them to learn and understand their users more and more. To have a viable shot at competing you must be prepared to invest heavily in a strong data warehouse, a talented marketing team and use metrics and data to decide which games have the strongest business case.